Stanley JSCV-9S Proto 9 Piece Black Chrome Reversible Combination Ratcheting Wrench Set - Spline Black chrome finish is corrosion resistant and visually distinctive. Fractional spline wrenches can be used on fractional 4, 6, 12 point, spline fasteners and Torx fasteners. The chrome-vanadium switch lever allows for easy changes in turning direction which helps improve speed. 15-Degree angled offset box end helps keep shank clear of obstructions. Anti-Slip Design (ASD) open end. 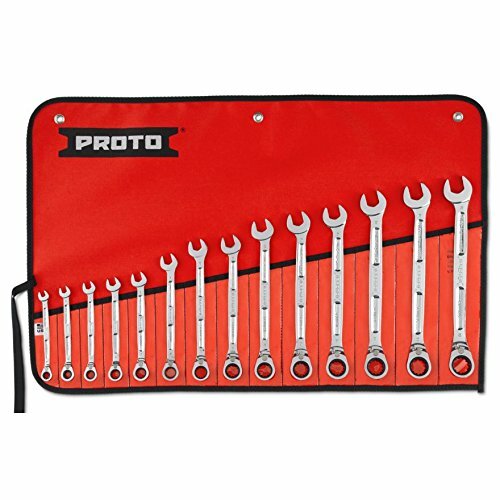 Stanley Proto JSCR28 Non-Reversing Compination Spline Wrench 7/8"
Stanley Proto 14-piece Full Polish Metric Combination Reversible Ratcheting Wrench Set - Spline. Spline design was created for use with specialty spline bolts which are used when weight and size of bolt heads must be minimized. The high contact surface area which is away from fastener points enables turning of highly rounded fasteners. 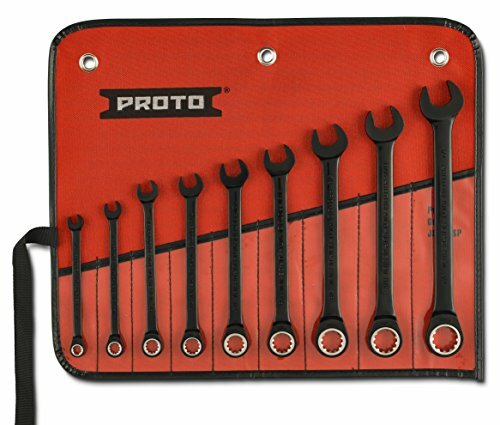 Proto JSCVM10: Metric Spline wrenches can be used on metric 4, 6, 12 point, spline and Torx fasteners. The chrome-vanadium switch lever allows for easy changes in turning direction which helps improve speed. 15 angled offset box end helps keep shank clear of obstructions. Chrome-vanadium box ends and switch levers provide high strength and durability. Box end is countersunk for easy application to the fastener. Spline design was created for use with specialty spline bolts which are used when weight and size of bolt heads must be minimized. Spline design enables the wrench to contact conventional fasteners away from the corners, which applies force over a larger area, reducing risk of fastener scoring and helps prevent rounding of the corners and other fasteners damage that could lead to Foreign Object Damage (FOD). The high contact surface area which is away from fastener points enables turning of highly rounded fasteners. Anti-Slip Design (ASD) open end. Black chrome finish is corrosion resistant and visually distinctive. 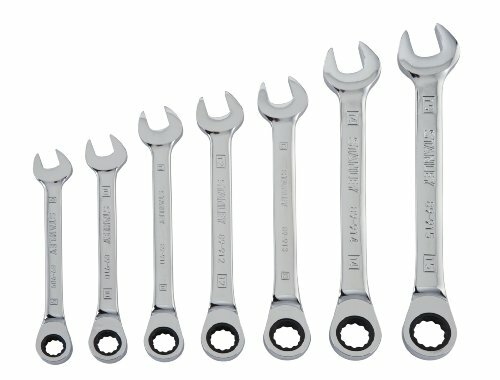 Stanley JSCR-9S Proto 9 Piece Black Chrome Non-Reversible Combination Ratcheting Wrench Set - Spline Black chrome finish is corrosion resistant and visually distinctive. Non-reversing ratcheting wrenches can be flipped over to turn the fastener in the opposite direction. Ratcheting spline box end is countersunk for easy application to the fastener. Spline design was created for use with specialty spline bolts which are used when weight and size of bolt heads must be minimized. Spline design enables the wrench to contact conventional fasteners away from the corners, which help apply force over a large area helping to reduce risk of fastener rounding. Spline design also helps prevent rounding of corners and other fastener damage that could lead to Foreign Object Damage (FOD). The high contact surface area which is away from fastener points enables turning of highly rounded fasteners. Anti-Slip Design (ASD) open end. Fractional spline wrenches can be used on fractional 4, 6, 12 point, spline and Torx fasteners. 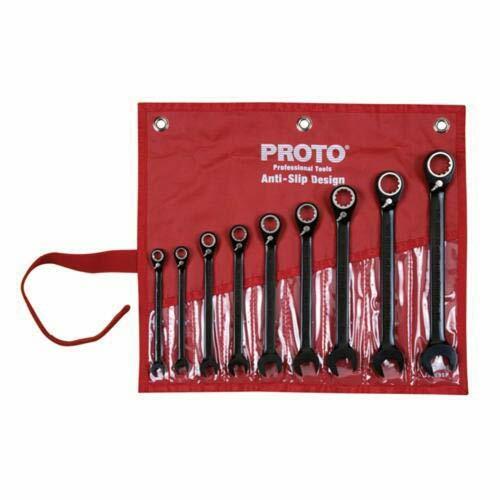 Proto 9 Piece Non-Reversible Ratcheting Combination Wrench Set - Spline Includes the following items: JSCR08, JSCR10, JSCR12, JSCR14, JSCR16, JSCR18, JSCR20, JSCR22, JSCR24, JSCR9SP. FEATURES:Black chrome finish is corrosion resistant and visually distinctive. Fractional spline wrenches can be used on fractional 4, 6, 12 point, spline and Torx fasteners. The chrome-vanadium switch lever allows for easy changes in turning direction which helps improve speed. 15° angled offset box end helps keep shank clear of obstructions. Anti-Slip Design (ASD) open end. -Patented locking grooves help prevent the wrench from slipping off the fastener when turning. -The arched surfaces are designed to spread the contact forces over a greater area. -Loads are kept off the corners of the fastener which helps prevent fastener rounding. Stanley Consumer Tools DWMT72297OSP SAE Ratcheting Combination Wrench, Long-Panel, 3/4-In. 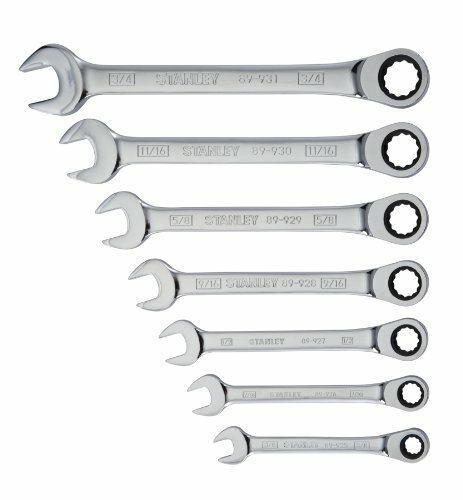 Want more Stanley Ratcheting Wrench similar ideas? Try to explore these searches: Cutlass Supreme Header, Petmate Le Bistro Microban, and Screw Nut Set.